Series creator Dan Harmon and the cast of Community took the stage at the TCA Winter Tour today, where it was announced that the long-awaited Season 6 will debut Tuesday, March 17 on Yahoo! Screen. Unlike the Netflix binge-watching model, Yahoo will debut new episodes every Tuesday after the March 17 premiere, which will include two episodes. Yahoo! Screen resurrected the series in June, ordering 13 new episodes, just a few months after it was canceled by NBC, and just hours before the cast members' options expired. Since Community isn't on network TV anymore, the show won't have the same content restrictions, but Jim Rash added that fans shouldn't expect characters on the show to start dropping R-rated language, although the episodes may run longer than usual, since they don't have the same time restrictions either. "I don't think Dan wanted to suddenly bring in cussing; it wasn't the world we had been in." 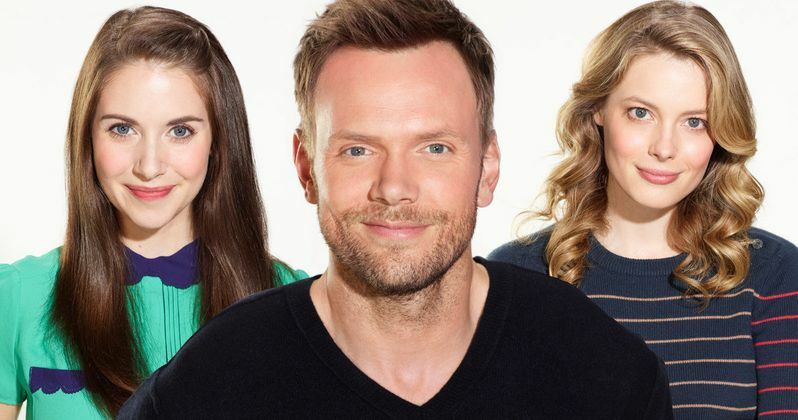 Original cast members Joel McHale (Jeff Winger), Danny Pudi (Abed Nadir), Alison Brie (Annie Edison), Gillian Jacobs (Britta Perry), Ken Jeong (Chang) and Jim Rash (Dean Pelton) will be back for Season 6, although Donald Glover (Troy Barnes), Yvette Nicole Brown (Shirley Bennett) and Jonathan Banks (Professor Hickey) are not coming back. Paget Brewster and Keith David join the cast this season. Very little is known about the story line for Season 6, but hopefully we'll learn more in the near future. While it doesn't contain any footage from the season, a new video was shown during the TCA panel, where stars Joel McHale, Danny Pudi, Alison Brie, Gillian Jacobs, Ken Jeong, Jim Rash and Paget Brewster revealed how they don't need to "promote" Community anymore, although a series of embedded subliminal messages are shown. Take a look at this new video below, along with some tweets from Community's official Twitter page with highlights from today's panel.
.@danharmon on if he has a definite end in mind for the show: "I have to continue writing the show as if it's going on for 20 seasons."